Epson C64 Photo Edition printers have everything it takes to produce excellent prints. Sooner or later your Epson C64 Photo Edition will run out of printer ink, and when that happens you'll soon notice that brand new Epson C64 Photo Edition ink is typically costly. Thank goodness you do not need to panic about forking out the steep prices you'll see on the high street because here at Cartridge Save you can purchase all the Epson C 64 Photo Edition cartridges you will ever need at ultra competitive prices. Save more cash on your ink by purchasing with us. Why pay high prices for a C-64 Photo Edition original cartridge or C64 Photo Edition compatible ink on the high street when it is much easier to save a pile of money buying with Cartridge Save. Have full confidence by ordering Stylus C64 Photo Edition ink cartridges from us because each one is underwritten by a quibble-free money back guarantee. Take into consideration that every single purchase comes with free delivery, most likely delivered the very next business day! Marketed as a photo printer, the Epson Stylus C64 Photo Edition was introduced to replace the Stylus C62. It promises to be faster and deliver printouts that will last for years, regardless of the media used. The Epson Photo Edition C64 is compact, lightweight, and user-friendly, but high costs per page may turn off the budget-conscious user. The Epson Stylus C64 Photo Edition inkjet printer resembles the Stylus C64 and it retains some features similar to its sibling including the 4 individual ink cartridge system and the USB connectivity. Paper input is at the back with the USB port, while the output tray is in the lower front centre of this 17.7-inch wide device. The Stylus C64 Photo Edition looks sleek, too, but unlike its sibling, it is significantly lighter, weighing only 3.9kg. Printouts last longer because of DURABrite Inks. 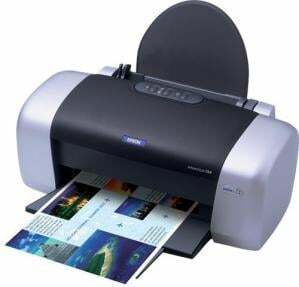 The Epson Stylus C64 Photo Edition printer does border-free graphics and photographs very competently, and text output looks sharp in a high resolution of 5760x720dpi. The Epson Stylus C-64 Photo Edition is versatile in supporting various types of commonly-used media including envelopes, labels, cards, and transparencies. One of the drawbacks of the Epson Stylus C64 PE printer is the low-yield ink cartridges which elevate the costs per page higher than those from the competition. The Epson Stylus C64 photo printer lacks direct printing capabilities, which could have made it more efficient and useful for photo printing. The absence of networking limits the Epson Stylus C64 Photo Edition printer to only one user.